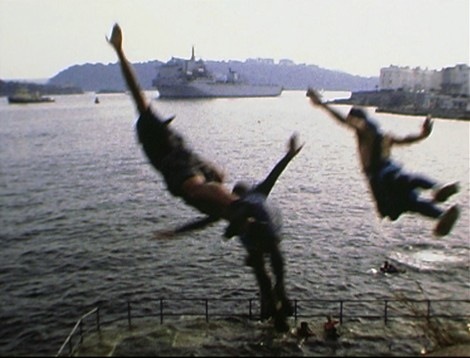 The poetry of Plymouth Sound and city seaside culture captured in glorious Kodachrome Super 8: meet the young tombstoners who gather on the cliffs under Plymouth Hoe at high tide to launch themselves into the waves below. Shot on the last few remaining rolls of Super 8mm Kodachrome 40 colour reversal film before the processing lab closed, with location sound recordings. The film Sea Front focuses on the area of Plymouth Hoe next to the sea known as the Foreshore, where the once-grand man-made structures built into the limestone cliffs in the nineteenth century are now cracked and crumbling. This space between land and sea is the site of rites of passage for modern-day Plymouth youth, who gather here at high tide throughout the summer months to leap into the water. Sea Front, directed, filmed and edited by Stuart Moore, and produced by Kayla Parker, is the first film to be released from the Sea City project, ongoing collaborative research with Stuart Moore that explores the perimeter of Plymouth along its boundary with the sea. Sea Front features in the British Council’s Britfilm Catalogue 2011 in the Experimental Shorts section. Philip Ilson (2010) The art of short films Film Features, The Quietus. 8 January 2010. Marine Screen Marine City Festival, Royal William Yard, Plymouth; evening screening outdoors presented by Plymouth Arts Centre, Dartington Barn, and Peninsula Arts (15 September 2012). Showing as the 2011 Deluxe telecine version. Other films screened are Cinematic City and Yessling, showing before Jaws.